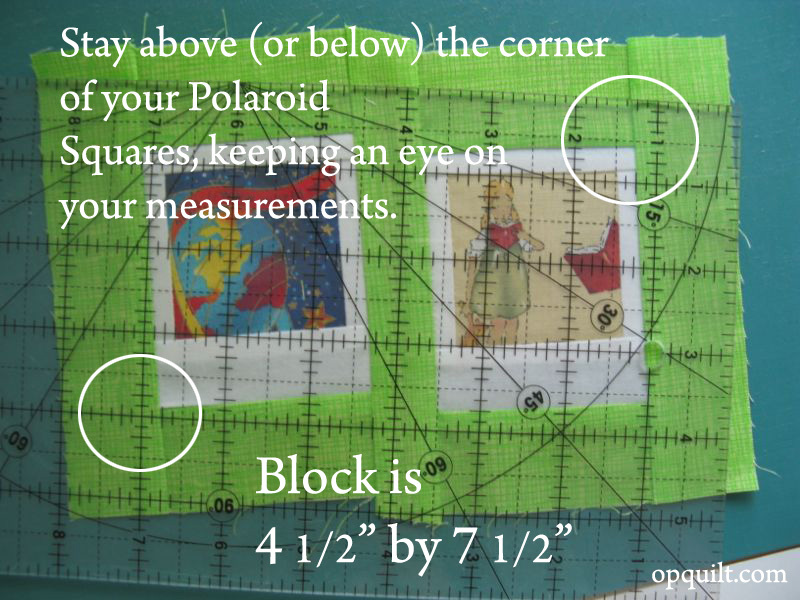 Snapshot: Constructing the Double Polaroid Blocks | OccasionalPiece--Quilt! 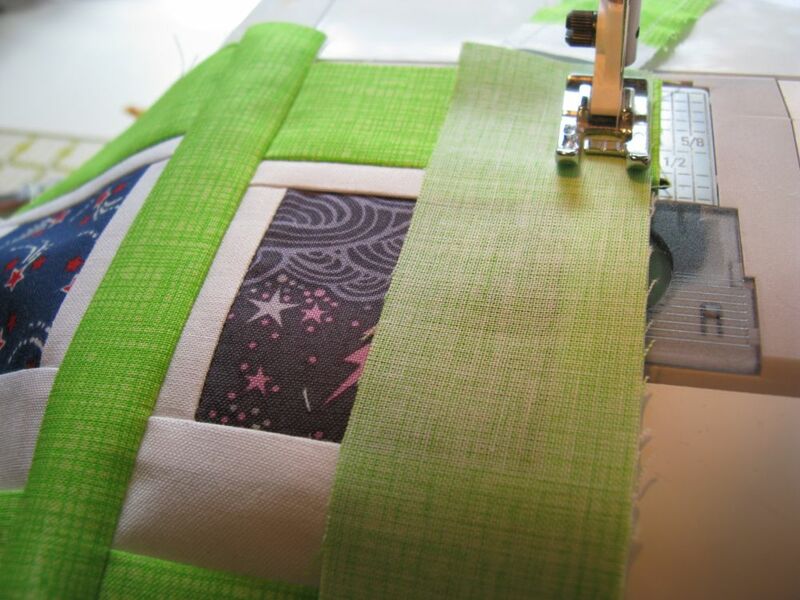 First, let me say a thank you to Lee of Freshly Pieced Fabrics, who is hosting WIP Wednesday for us. 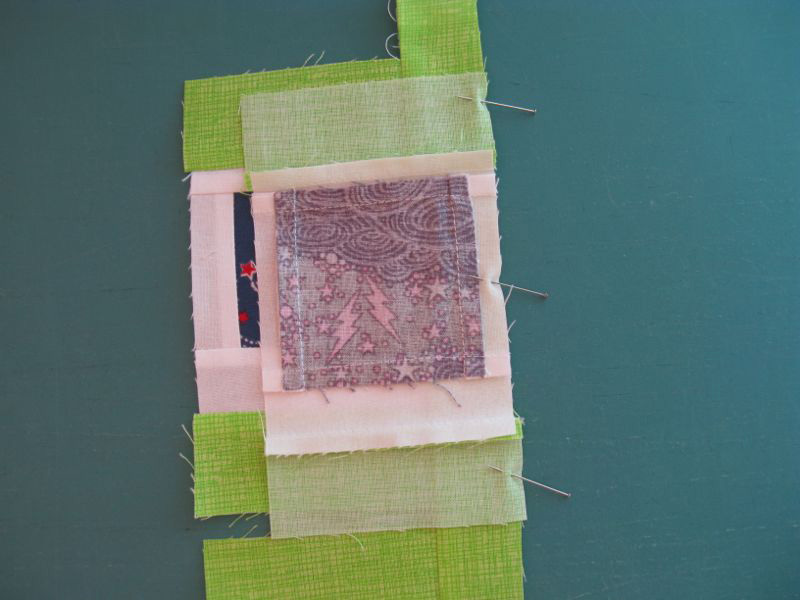 Click *here* to return to her blog and see other fabulous Works-in-Progress. 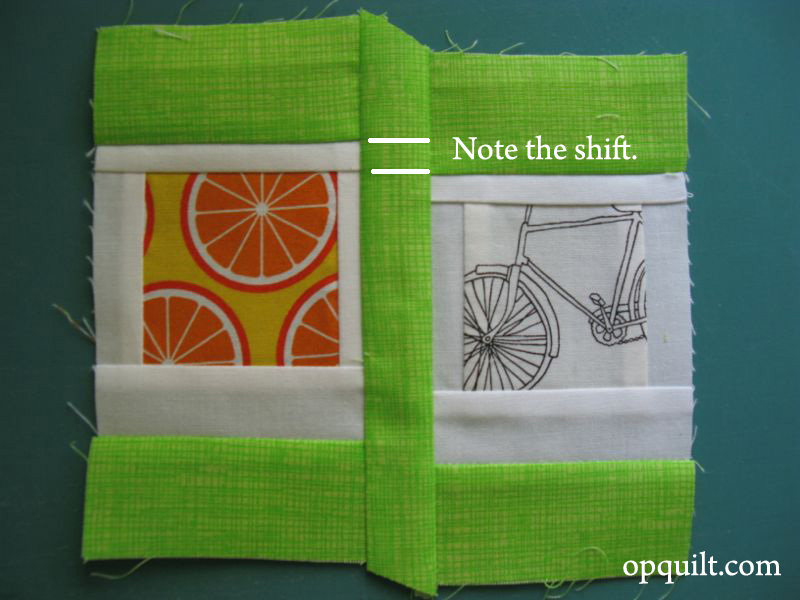 If you missed yesterday’s post about Snapshot, my latest quilt (above), scroll down as there is information for fabric requirements and a basic How-To for Polaroid Blocks. I did these in sets. You’ll end up making about 4 sets, alternating the blue fabric with the green fabric (only use one color at a time), as each stack is made up of 13 blocks. However, I made a few more of each color, because I doubled up on some colors for variety (you can see it above where there are two blue blocks together). So make 4 1/2 sets. 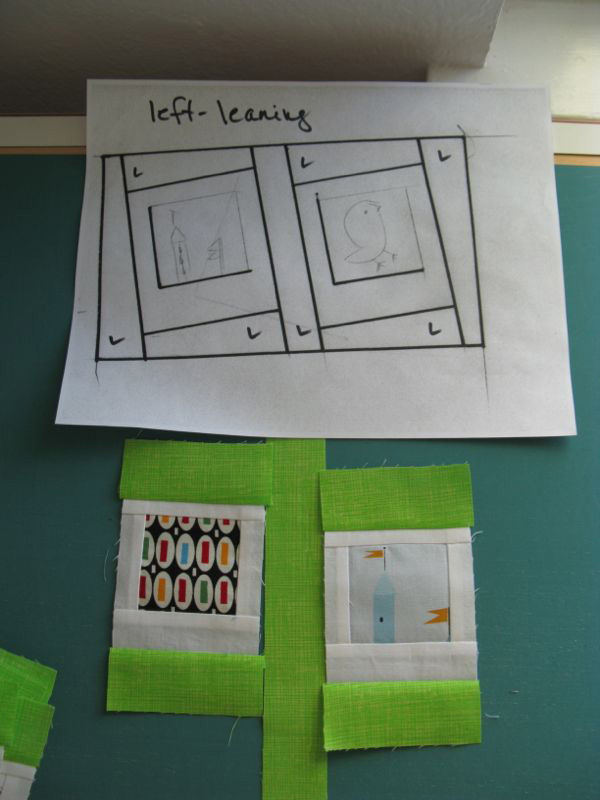 Start by sewing the Polaroid blocks to to the wider (1 and 1/2″) strip, placing Polaroids face down. You are sewing this to the TOP of the blocks. 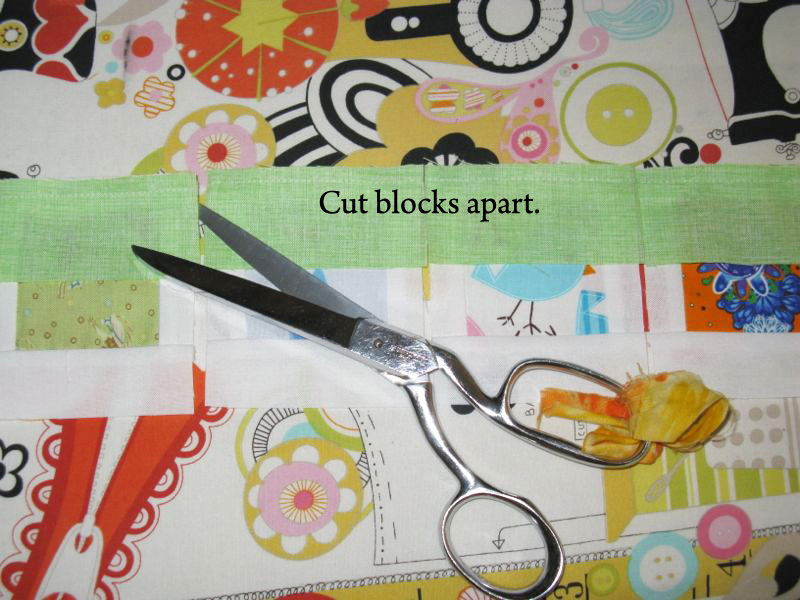 Lay out the strip of blocks and cut the blocks apart. With scissors. Remember those? We finished up our discussion of The Shallows: What the Internet is Doing to Your Brains in class, and the last section talked about tools; when we adapt and adopt a tool, it become an extension of us and we may leave older tools behind if the new one suits us better. So if you feel like the rotary cutter is an extension of your hand, you may need to practice using scissors again. Kidding. 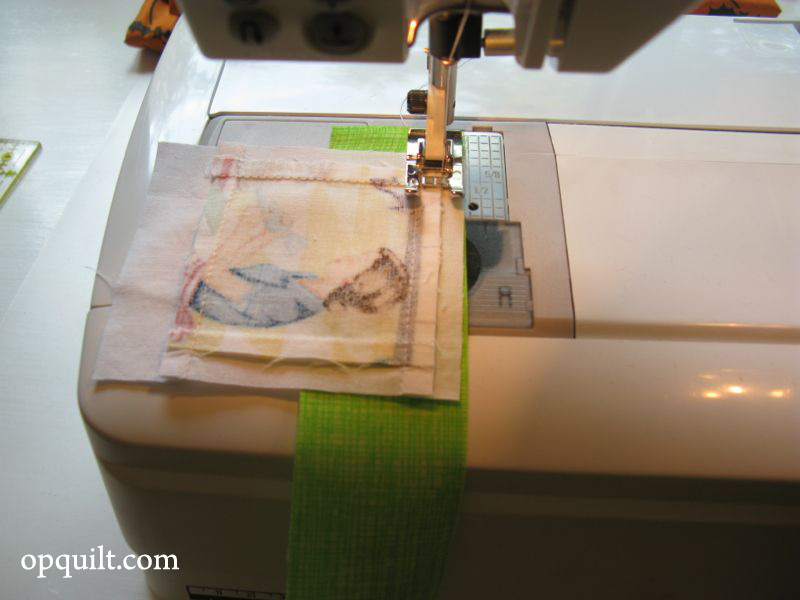 Now sew another wide strip on the bottom of your Polaroids. 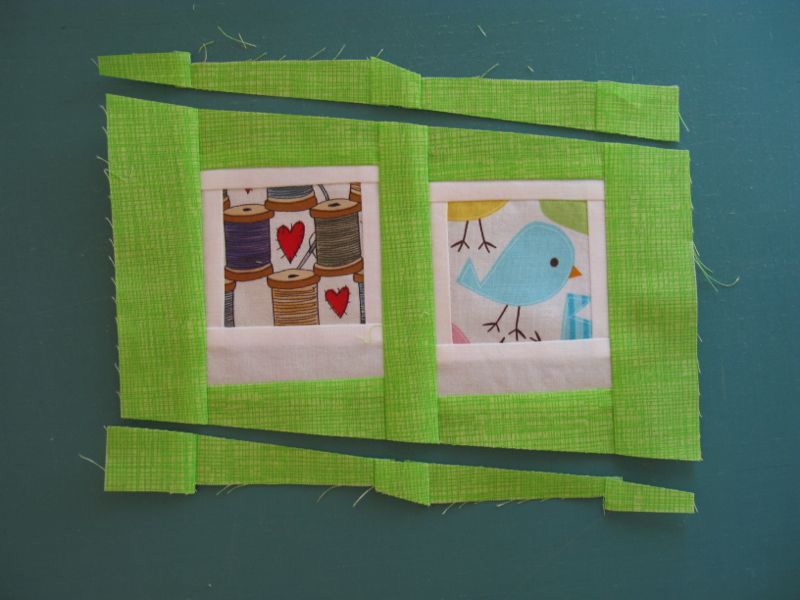 Here’s four blocks, with the top and bottom borders sewn. 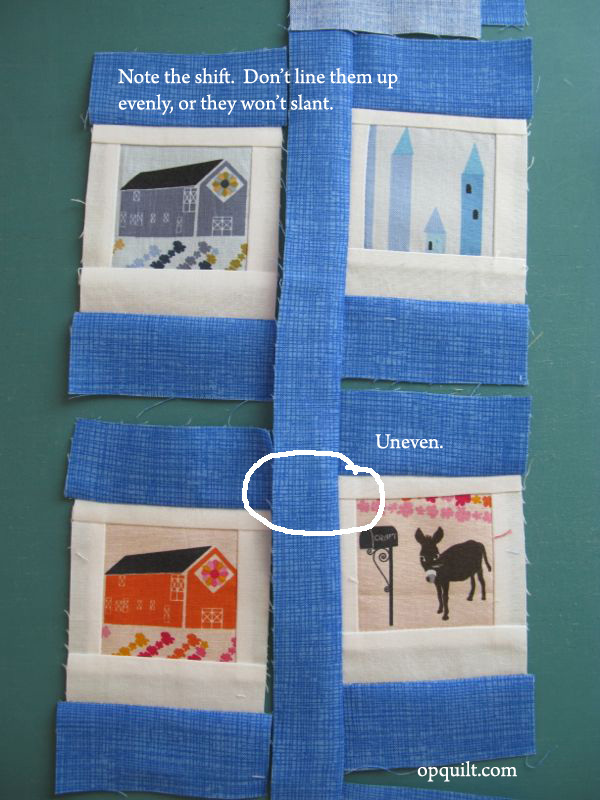 Again, you are using the 1 and 1/2″ width fabric. 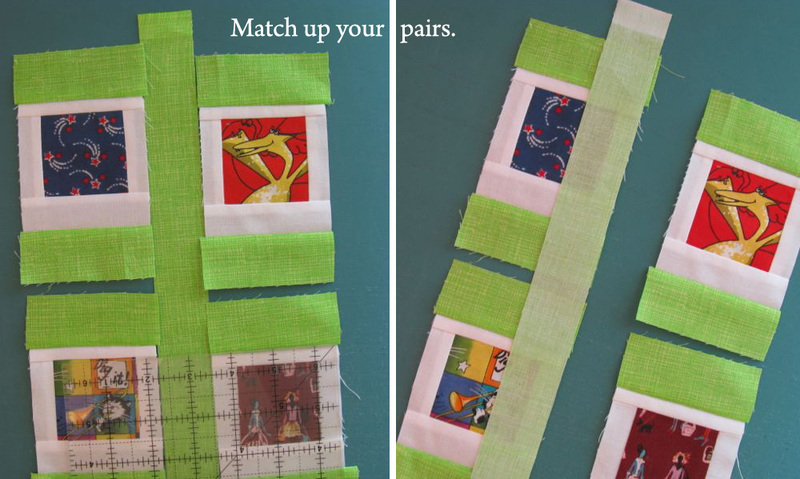 Lay out a strip of the narrower fabric (1 and 1/4″) and place your blocks side by side, matching up your pairs. Separate them by about 1/4″ at the bottom. I pinned them so it would be easier to transfer to the sewing machine. 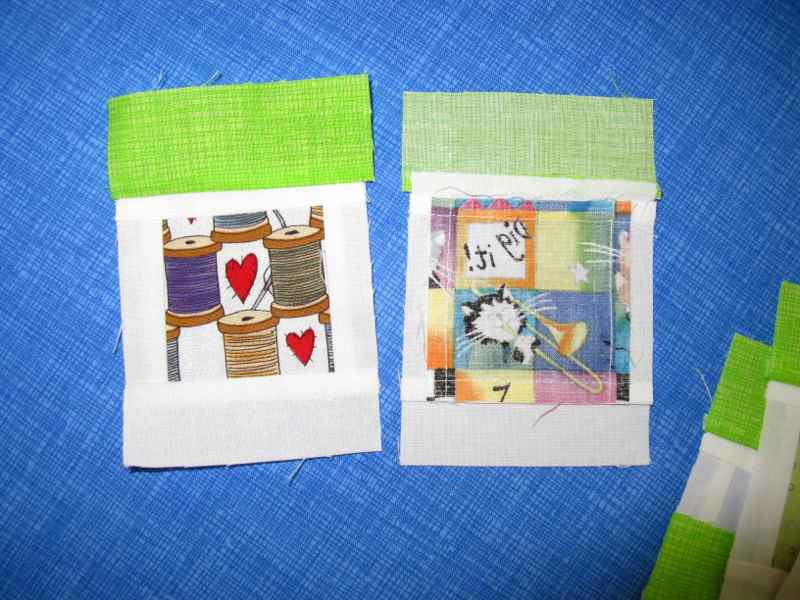 Sew the first set (one side) onto the center strip. You should be able to get about 7 Polaroids per strip. 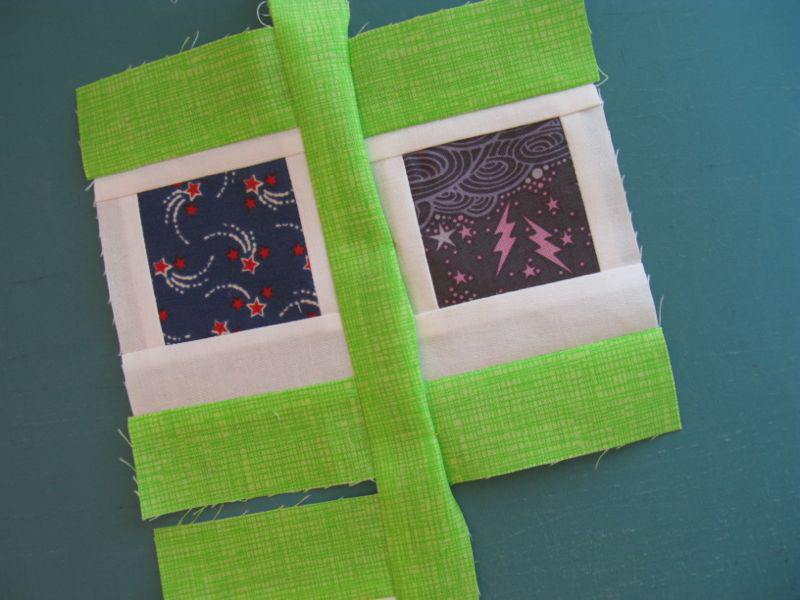 As you sew on the first set, pay attention matching the edge of the Polaroid block to the edge of the center strip, letting those little bits of borders stick out. You can cut them off in an earlier stage if you need to, but I did mine after sewing them. 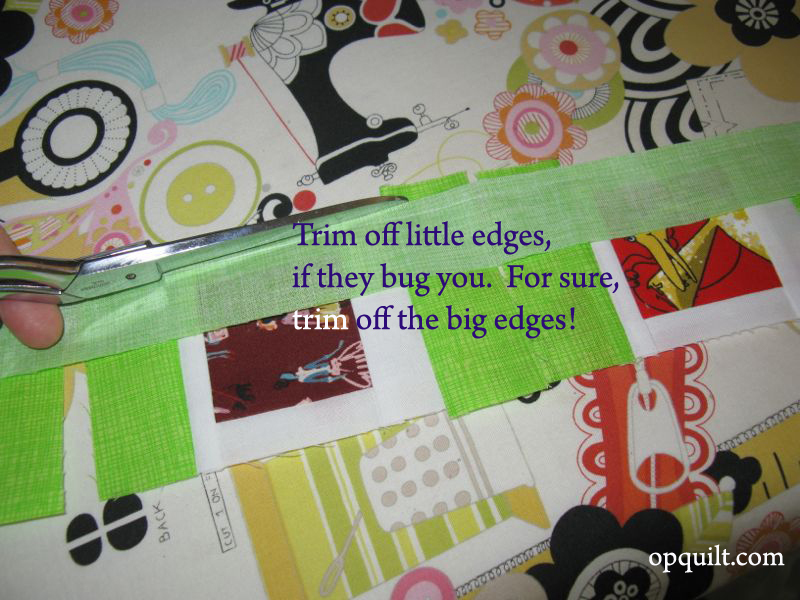 NOW trim off the little edges if they bug you. For sure, trim off the big overhangs! Just lay out the strip as shown, and cut the overhangs off, even with the long strip. DO NOT CUT THEM APART!!! Let me repeat. DO NOT CUT THEM APART!! 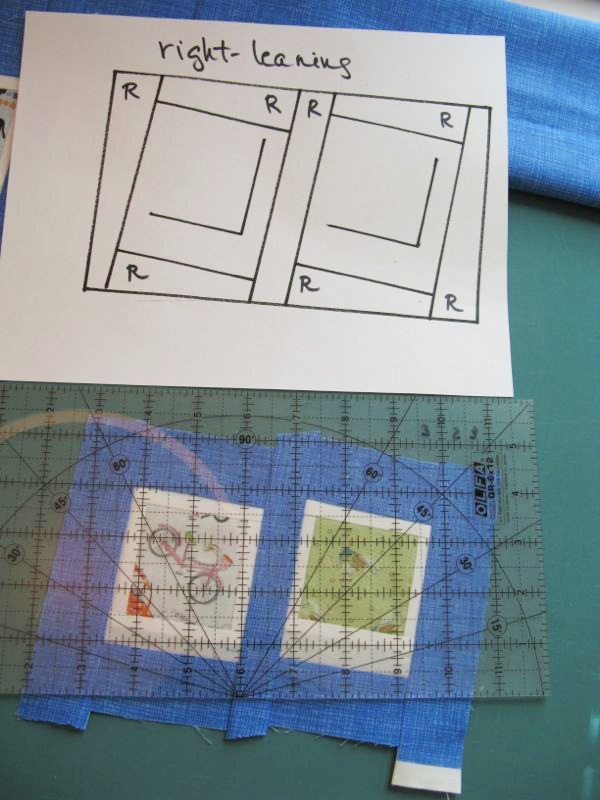 Now, take your “right leaning” and “left leaning” PDF printouts from the last post, and set one of them at a time on the table while you do the next step. I made all the greens to lean to the LEFT. All my blues lean to the RIGHT. It feels backwards, but here we go. I used the picture to get in my mind which Polaroid should be 1/4″ up and which one should be 1/4″ (or the width of that top border) down as I’m lining them up along that center strip. Notice in this high-quality illustration that the blocks lean to the right. 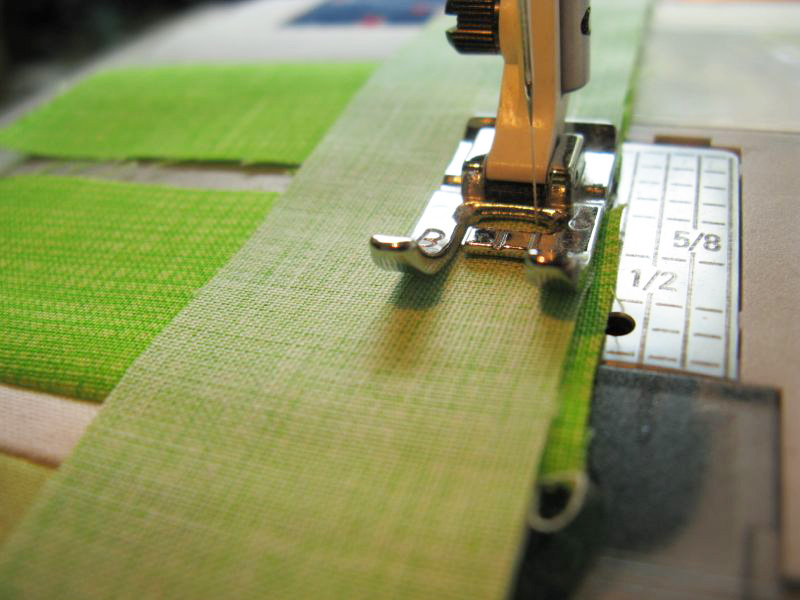 To accomplish this, you have to offset them when you sew them to the center strip. The left block is “lower” on the strip, and the block on the right side is “higher.” This is why I used two colors: to keep things straight. 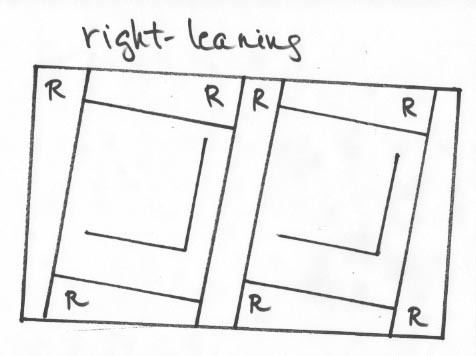 But my greens tilt the OTHER way, so I used the “left leaning” diagram to help me. Again, to get the tilt, you need to jog the one on the top down about one-fourth inch. What I did was line up the edge of the green border with the top of my center picture in my Polaroid block. (I know this sounds confusing, so just look at the pictures.) This will give you that offset you need in order to tilt your block. Do this with the remainder of your pairs. Pin, then stitch. When working with the blue, I reversed the sewing, stitching the blocks on the right-hand side of the center strip first, then the left. Here it is sewn. You can really see the slipped alignment here. Press this seam toward the center strip. See two steps down, for the why of pressing. Cut these blocks apart now; the cut will be angled to fit the skewed alignment. Here’s one that’s been cut apart after sewing. Here you can see the shift. And in comparing these two blocks (the one directly above and the one below), you can see the difference the pressing makes. The pressed edges can either make a block look like it’s resting on the top or like it’s “sunken” into the strips surrounding it. I wanted my Polaroids to have that look of being bordered by strips, not the strips “supporting” and “lifting” up the Polaroids. So that’s why all the pressing directions indicate which way to press the seams. Here you can see the different pressing. All right Goldilocks, you are through the deep scary forest and just about to claim that pot of gold at the end of the rainbow. 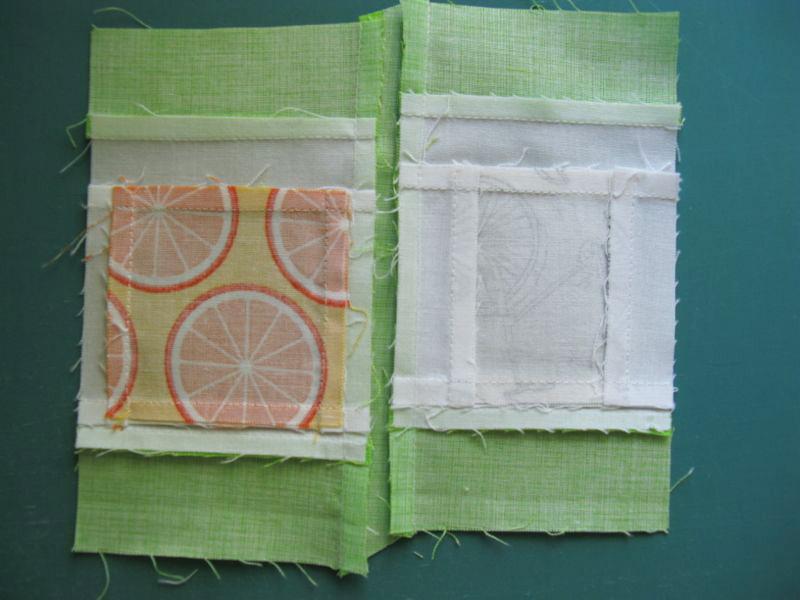 Using the wider (1 1/4″) strip again, sew the outer borders onto both sides of your block assemblage. Cut apart. You should have 13 blocks that look like this. Now comes more fun, more forest. Get out that PDF picture again. Lay it at the top while you trim your blocks. The size you want to trim to is 4 1/2″ by 7 1/2″. 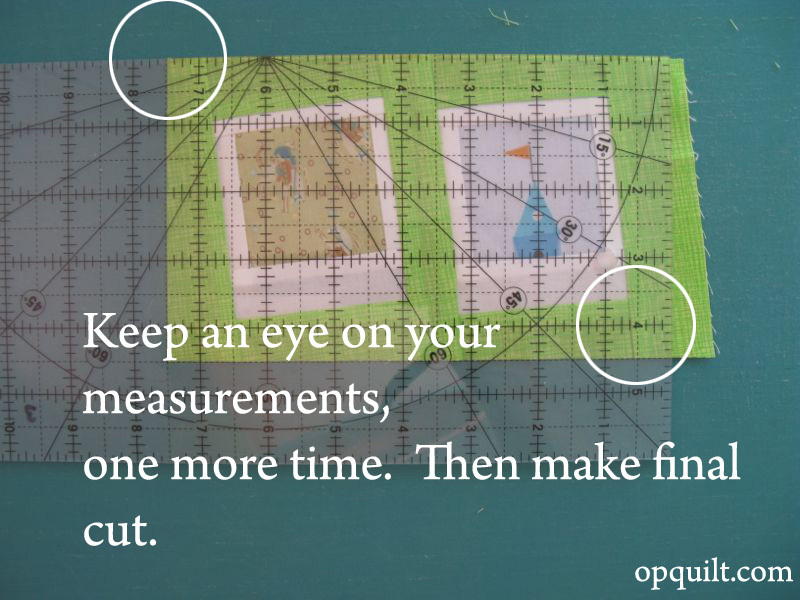 You need to tilt your ruler a bit, making sure you leave at least 1/2″ space between the edge of your white Polaroid interior block and the planned cutting line on the outside edge of your ruler. (This is why you make extra blocks, if you get my drift.) I tried to vary my cuts, because I think one of the charm of these Polaroid blocks is their wonkiness when set into their frames, much like a child would paste vacation photos into an album. So sometimes I was just over 1/2″ from that edge, and other times I was closer to 3/4″. Keep at eye on that 4 1/2 line, as well as the 7 1/2″ line. Be a juggler, keeping all these things in mind as you go for your first cut, slicing off the top of the block. Then flip it around, putting the cut edge at the bottom. 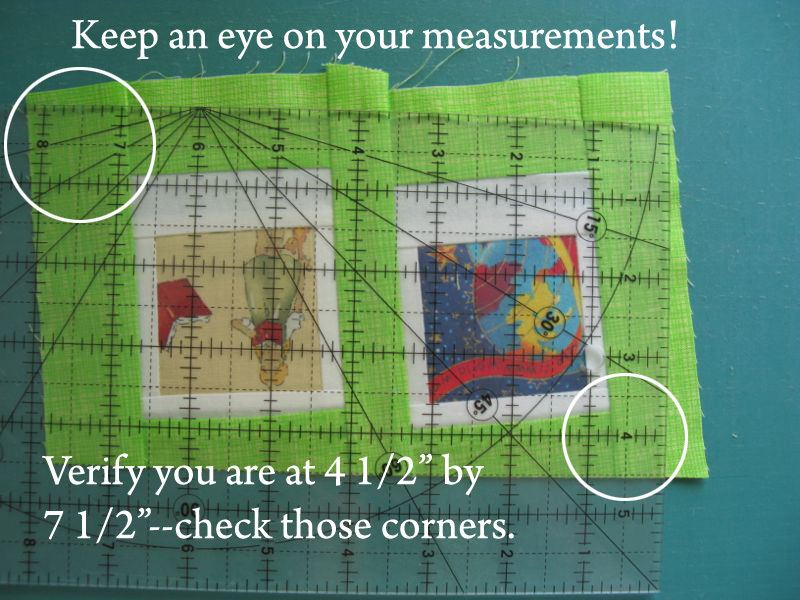 Lay the 4 1/2″ line of your ruler at the bottom, lining up your freshly cut edge. Check your measurements. You want the bottom lined up, but you also have to check that the block is centered so when you cut off that right side, you’ll have an evenly centered 7 1/2″ block. If you are good to go, slice off that right-hand side. At first, I flipped it around again, as I’d only have to pay attention to one last side (shown above). But after a while I became confident enough to slice off the top, >flip<, slice off the right and top edges again, then >flip< cut the last edge off. Which is what I’m doing in the picture above. I took this photo mid-cutting to show you how the block can feel skitty-wampus when you look at the first two cuts. But then you slice off the two side edges and you are Through The Forest Again! 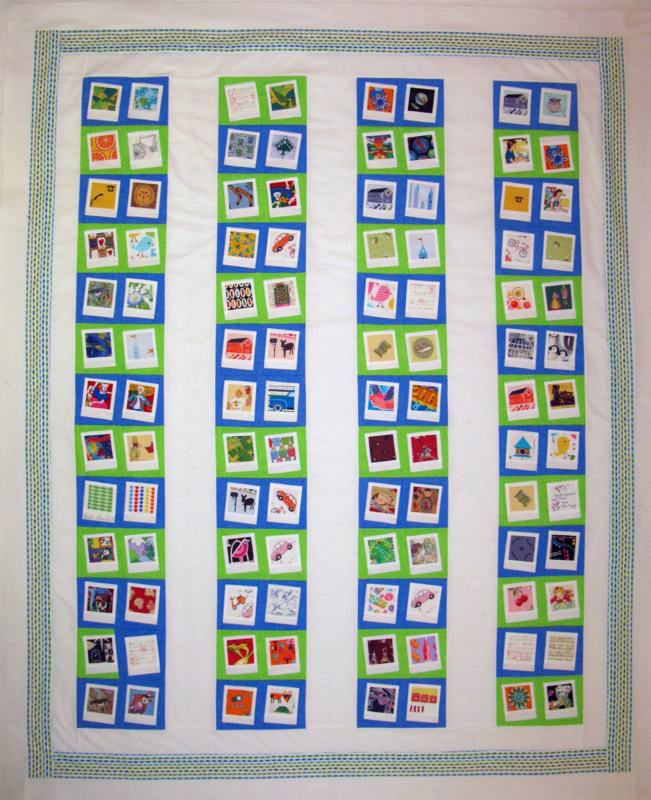 In the arrangement of my quilt, I used 28 blue double-Polaroid blocks and 24 green. Make enough that you have some to play around with, and if you like decorations on the back of your quilts, include some for that too. NEXT POST: Putting the quilt top together, and one day closer to my surprise giveaway. Thank you for the tutorials and for the reminder to check and check before cutting. Can I say I think this quilt is wonderful! 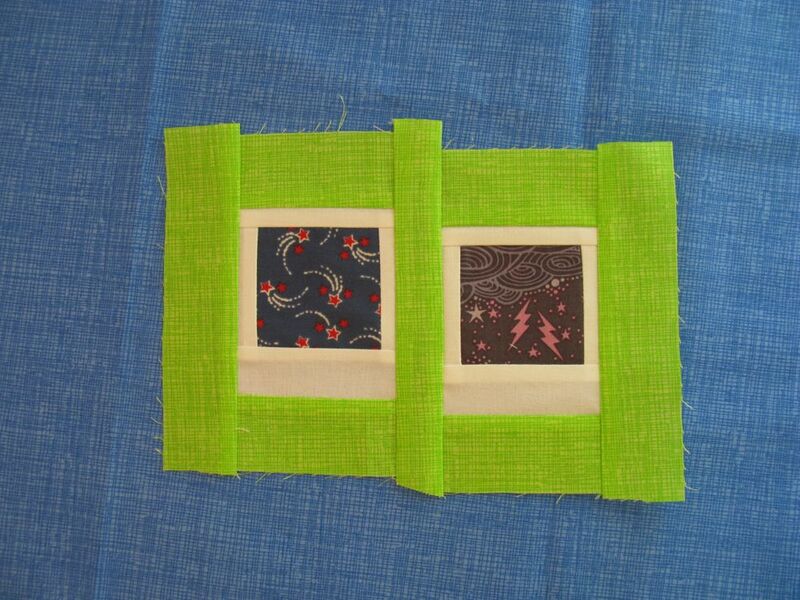 It is so great to have this nice tutorial and I can think of many fabrics to use as the centers. 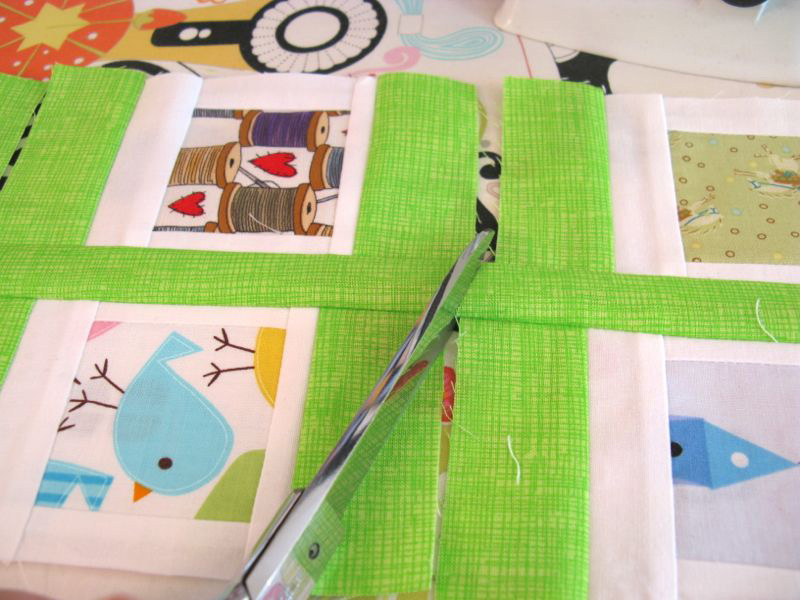 Lot’s of fussy cutting and a great project. I want to thank you for taking the time to post the pictures and explaining everything so clearly. It was very nice of you to do that for us. I really like this quilt. Wow, looks like a lot of work, but very cool. I love how you are able to write messages, even draw circles in the middle of your pictures. How do you do that? This is a wonderful full-of-detail post! Thanks so much for taking the time – it’s really helpful! I’m impressed that you could come up with 104 different “snapshots.” I love it! I’m looking forward to seeing what fabric you choose for the back. 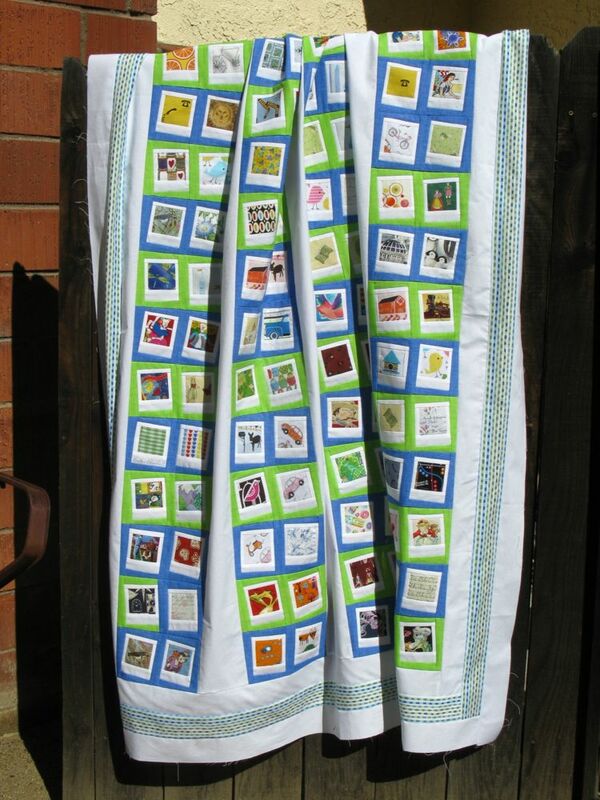 I really like this quilt. 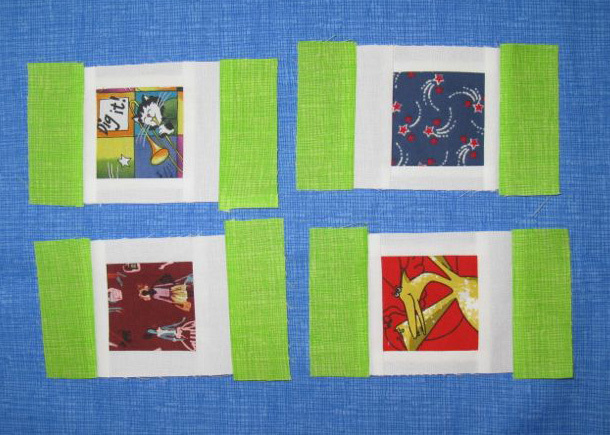 I think the polaroids are such a cool twist on the I-spy quilts. I am not so young that I don’t remember polaroids!